The previous CILIP definition was devised in 2004 however the theory and practice of IL has evolved considerably and the group believed it was timely to undertake a review. The IL definition is quoted as one of the most viewed pages on the CILIP website so it is vital that the page reflects current practice. We also wanted the definition to be relevant for everyone, as we all interact with information everyday, not just information professionals and certainly not just librarians in formal education roles in schools, colleges and universities. A small working group was formed in March 2016 comprising of members of the ILG committee, with the task to revise the definition. In 2016 we consulted with ILG members allowing them to comment on the current definition and provide their views. In April 2017 I (Jane Secker) and Nick Poole, CEO of CILIP ran a session at the LILAC Conference to get more feedback on what should be included in the definition. With a number of responses we are indebted to the late Rowena Macrae-Gibson for pulling all our thoughts together to form the basis for the definition. The definition has 4 elements beginning with the high-level definition as quoted above. There is then a secondary statement to provide supporting information, which recognises the complexity of the term and how it relates to other terms such as digital and media literacy. A third element was to include a number of contexts for Information Literacy to show the relevance of it beyond formal education. These include how IL relates to everyday life; to citizenship; to education broadly; to the workplace and to health. Finally we highlight the role of Information professionals in supporting IL. This is particularly important at a time when there has been an erosion of school and public library professional staff. Information professionals are needed to advocate, support and enable IL and this works best in collaboration with other professionals to embed IL appropriately for the learner or user. How does this work in practice in public libraries? 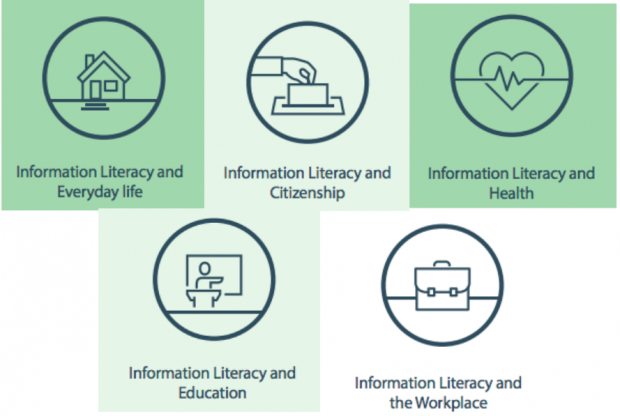 Information literacy initiatives in public libraries are hugely varied in scope and overlap quite significantly with initiatives to help get people online, to use the internet in their everyday life, to help them pay bills or claim benefits. However, some initiatives also focus on supporting people improve their health literacy, to make choices about their own or others healthcare. In many cases public libraries often work with charities who operate in the digital inclusion sphere. For example: The Welfare Reform Act (2012) has had an impact on public library use as they have free internet access, computers for public use and wifi. These are used by those on Universal Credit who do not have facilities at home and require to access their accounts. In addition, some public libraries provide digital support as well as just access. Stirling and Clackmannanshire are two Scottish authorities who have been providing such support for job seekers and have been successful in getting a research bursary from CILIP ILG to establish the impact on employability of public library digital participation programmes. This research will inform local authorities of the vital work that public libraries do to support all in the community and especially those who are job seekers. Another CILIP ILG funded project was led by Dr Konstantina Martzoukou of Robert Gordon University. A small number of Syrian families have moved into the area and they wanted to examine the information literacy practices of Syrian new Scots (the Syrian refugees in Scotland) during their resettlement and integration. Upon arrival in Scotland, their needs were very specific from how to use the transport system, internet access and digital support. An example of this in practice is Aberdeenshire Libraries who are supporting a local group of Syrian New Scots to improve their digital skills by meeting weekly in the library. A series of events are also planned in local libraries to help integrate the families into their communities. Newcastle City Library has been very proactive in supporting digital skills with their pioneering project Go Digital: Newcastle. The digital by default agenda is putting those without the means or skills to access the Internet at increasing risk of isolation. They are aiming to overcome these barriers by providing relevant, local opportunities for those who feel digitally excluded to develop, or improve their information literacy skills. Ultimately, helping people with the skills, access and confidence they need to get online. A real fear for those digitally excluded is a loss of their privacy which is why they opt out of an online presence. To combat this, Newcastle City Library is providing help sessions for citizens to understand how their personal information is collected online and on their mobile phone. This allows them to make informed decisions about their privacy and learn about software and tools they could potentially use that would help them protect their data. The "Take control of your online life" sessions are providing real help as libraries are seen as trusted sources of support. The Good Things Foundation have a network of Online Centres which includes a large number of public libraries. Staffordshire Libraries is one such library service who has benefitted from funding from The Good Things Foundation which they have used to provide Basic IT skills sessions using the Learn My Way resources. Again, this is providing the information and digital literacy skills for those who want to be able to connect with the world. And it isn’t just digital and information literacy skills that public libraries are supporting. Norfolk Healthy Libraries Project is an example of providing health information literacy whilst helping customers to become more healthy and take part in activities. Have you gone along to your local library for a yoga class? Residents in Norfolk can do just this. This reinforces libraries as trusted sources of information and support in local communities. When services such as culture and sport are joined together, and at times co-located, this kind of joint project is easily accomplished. Read more about this initiative. Provision of health literacy sessions requires trained public library staff so in order to facilitate this CILIP’s Public and Mobile Libraries Group have been running Health Literacy Workshops to up-skill public library staff in supporting library users' Health Information Literacy. With thanks to Jacqueline Widdowson and Aude Charillon from CILIP PMLG for providing some of the case studies in this article.